UNSTABLE has been invited to participate in EME3 International Architecture Festival, from June 28th to July 1st 2012 in Barcelona, Spain. 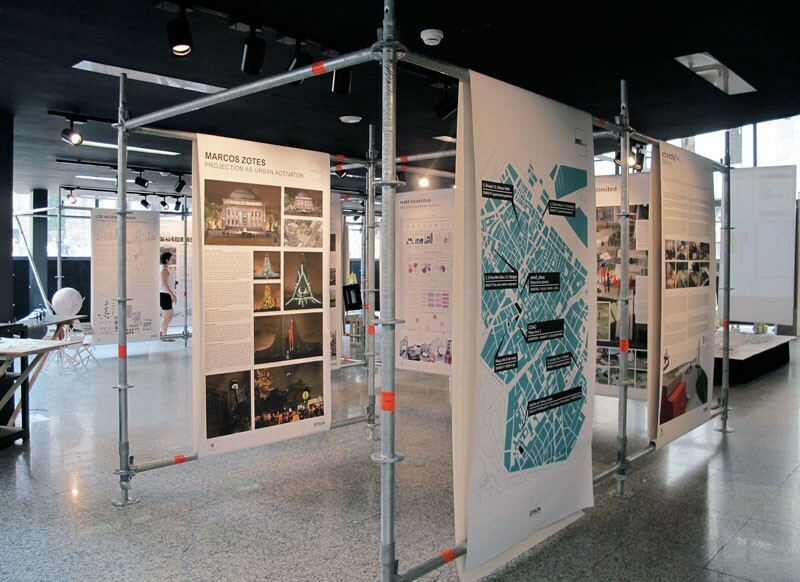 Under the theme "Bottom UP", our research project "Projection as Urban Activator" is exhibited during the exhibition and forms part of the exhibition publication. The work explores the medium of light projection on urban public space as a means to question the oppressive mechanisms and discourses implemented in the city, focusing on notions of appropriation, subversion and activation of public space. The topic of the 7th edition of the International Festival of Architecture EME3 starts from an exploratory analysis of the application of the concept “BOTTOM-UP” in architecture and its relationship with society. When we talk about a bottom-up approach, counterposing it to the top-down, as the name suggests, it means starting with the detailed design of the individual parts, to afterwards link them to form larger components who will end up conforming a complete system. Strategies based on bottom-up information flows are potentially necessary as they are based on the extensive knowledge of all variables that may affect the elements of the system. In a changing environment like the current, where the foundations of our system are constantly questioned and challenged, a series of actions, which to date had a fairly minor implementation in developed societies, emerge now strongly, relying on creativity and innovation to fight this moment of crisis and uncertainty. Eme3 wants to give support to these initiatives originated through and with the civil society, and has decided therefore to enhance and promote bottom-up approaches in the two modalities of the call for projects and by invitations.